Weekend rides are listed in the club Events Calendar by Thursday of each week, and a listing is e-mailed to each club member. All rides are weather permitting - cancellations are announced in an e-mail to members. Weekday rides are announced each Monday and are posted on the club calendar. If you're not a member and wish to ride with us, contact the club president at abc_pres@annapolisbicycleclub.org to verify ride time, distance and speeds. Also, please fill out and sign this waiver and hand it to the ride leader. 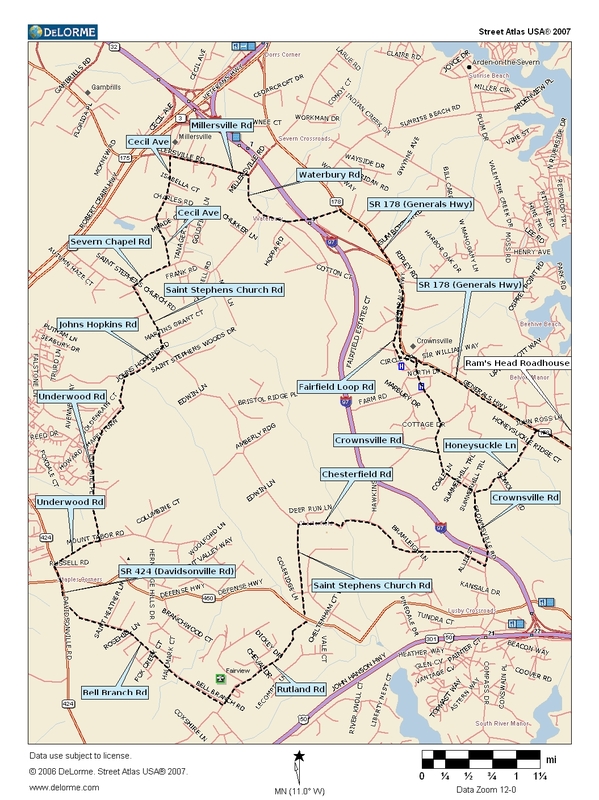 Many rides start at the Davidsonville Park 'n' Ride, located on route 424 just south of the intersection with route 50, for rides to Deale, Galesville and around South Anne Arundel County. We gather at the north end of the parking lot, that's the end closer to the stop light and to Rt 50. Look here for directions to the meeting location. See this link for other ride start locations. Helmets are REQUIRED on all ABC Rides! All rides should emphasize safe group riding and respect for motorists and other bicyclists. Ride distances tend to be shorter during the early and late seasons and longer during the summer. Most rides include at least one rest stop with snacks available for purchase. Call the ride leader if you have any questions and always take plenty to drink during the ride. When inclement weather is forecast the Club makes every effort to cancel rides via advance e-mail announcement. If, one hour before a scheduled ride, the official weather report for the ride start area predicts rain or strong winds, the ride may be cancelled. If you are in doubt, contact the Ride Leader. 13 - 14 MPH - On most Saturdays we offer a 30 mile ride at this pace. It's a no-drop ride, meaning that the group stops frequently and waits for everyone to catch up. 14 - 16 MPH - Rides are 35 - 65 miles over sometimes hilly terrain. 16 Plus MPH - For experienced riders able to average a pace of 16-plus mph over varied terrain for 50-60 miles. Users of any of these rides assume the risks that come with riding bicycles on public roads. Road conditions and traffic can vary from time-to-time! Wear a helmet, use your mirror, and STAY ALERT! Maps - dotted lines show roads we often ride. But all roads have traffic, so be careful!